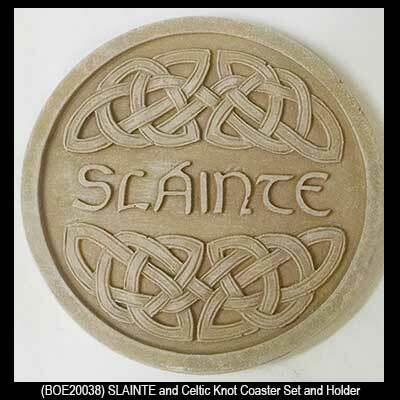 These Celtic coasters feature the word sláinte, a traditional Irish drinking toast, that translates to cheers or to your health in the Gaelic language! These five Irish coasters feature Celtic knots along with sláinte. A complementing holder with matching knot-work will cradle your Celtic coasters when they are not in use. 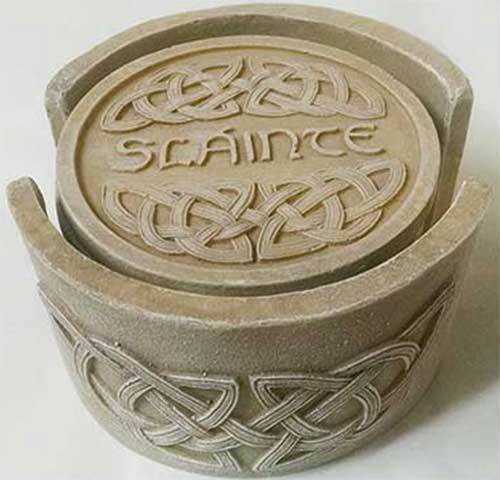 Both the 3 1/4" diameter sláinte coasters and the 4 1/2” wide x 2 1/2" tall holder feature padded feet and are enhanced with resin construction that has the look of stone. This beige color Irish coaster set is gift boxed with a Celtic knot history card, complements of The Irish Gift House.